18.01.2012. Employees of the Friedhelm Loh Group and Friedhelm Loh himself, the Group's owner and Chairman, joined forces again last year for their traditional end of the year donation. Social and charitable institutions near the group's locations are being supported to the tune of € 150,000. A total of € 570,000 was collected last year during the Group's major fund raising campaign. Traditionally, Friedhelm Loh, the owner and Chairman of the Friedhelm Loh group, along with the Loh group's employees, collect money together for a large annual end of the year donation. In 2011, around € 72,000 was collected through the commitment of the workforce, which Friedhelm Loh topped up to € 150,000 through a personal donation. The employees and the proprietor of the internationally active Haiger-based Group will use the funds to support social and charitable institutions and organisations close to the company's locations. "I find it fascinating and I am grateful that you have again shown so much commitment financially – in spite of the large fund raising campaign in 2011. So here in Germany, you are making your contribution to greater justice and providing help for those in need", said Friedhelm Loh, thanking his staff for their commitment. "Many people in the world live in need. We, however, live in a luxurious situation. It is our duty to help others", said Susanna Karan, Human Resources Manager responsible for employing international staff at the Friedhelm Loh Group. "The fact that we in the Friedhelm Loh Group are regularly committed to making donations – I think it's great!" Rapid and non-bureaucratic help - that is also the goal of "Elterninitiative krebskranker Kinder e.V." (Parents' Association for Children with Cancer) in Siegen. "If a child is diagnosed with cancer, then everything suddenly changes for the parents", added Sigrid Wiesel, the association's chairperson. "Most of the time, one of the parents stops working and can only look after the child. This is an extra financial burden for families", she explained. The association pays for visits to the many therapy sessions needed by the families involved. 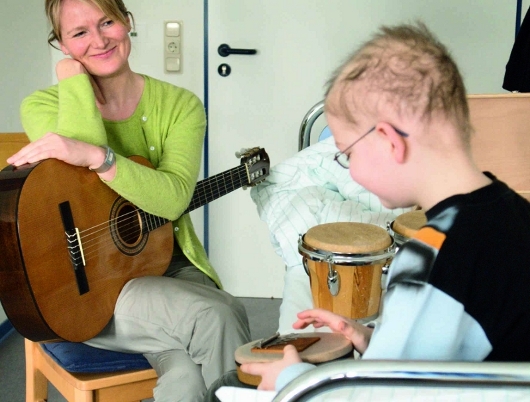 Besides this, it offers further therapeutic care, such as the additional music therapy treatment received by the children at the Siegen Children's Hospital or the Giessen University Clinic. "Thanks to this donation we can support children with cancer and their families", Sigrid Wiesel said in gratitude for the donation. One first port of call for people with addictions is the "Verein für Suchtkrankenhilfe" (Association for Helping Substance Abusers) in Dillenburg. "The different forms of addiction have changed greatly over recent years", Gerhard Möller, the Chairman of the Association knows. In the meantime, those affected are very heterogeneous, and many other drugs are involved besides alcohol, which makes the fight against addiction more difficult. "Thanks to the support from the Friedhelm Loh Group, we can now train our members to become anti-addiction helpers and so assist addicts even more in the fight against their disease", Mr. Möller added. Other beneficiaries of the Friedhelm Loh Group's year-end donation are the home care service of the Herborn and Sinn community care centre, "Helping Hands Burbach", the German Christian Association of Youth Villages in Gera, the Evangelical Integrative Child Day Care Centre for disabled and non-disabled children in Monheim, the Outpatient Children's Hospice Service in Siegen, the church-affiliated care centres in Haiger and Eschenburg, the children's home in Burbach, Lifegate Rehabilitation in Würzburg, and the "Eremitage" day care centre in Wilnsdorf. Last year, the Group's employees and Friedhelm Loh himself organised two large, international fundraising campaigns together. This way, a total of € 160,000 of help was collected after the Japanese flood disaster, and the staff and the proprietor Loh helped in the fight against famine in East Africa with a contribution of € 260,000. A total of € 570,000 was collected within the Friedhelm Loh Group in 2011 alone. "This is unique and highly commendable!" said Friedhelm Loh, impressed by the goodwill of his staff. Image 1: The initiative for parents of children with cancer in Siegen helps children with cancer and their families. Thanks to a donation from the Friedhelm Loh group, supplementary treatments such as music therapy can also be offered. Reproduction free of charge. Please specify "Friedhelm Loh Group" as source. Please send us a reference copy.